Take your fajitas to the next level with an easy guacamole salsa on the side. Reserve 2 teaspoons of the taco seasoning mix for salsa and set aside. Combine the remaining taco seasoning mix, lime juice and honey in a small bowl and mix well. Add in the beef strips and toss to coat. Leave to marinade for 15 minutes at room temperature. Combine the reserved taco seasoning mix and all remaining salsa ingredients in a medium bowl and mix well. Set aside. Heat a large non-stick frying pan over a high heat and add in the oil. Add the beef and the marinade and cook, stirring, for 2 minutes. Stir in the onion wedges and cook for 2 minutes. Then add in the pepper and continue to cook for 1-2 minutes or until the vegetables are just tender. 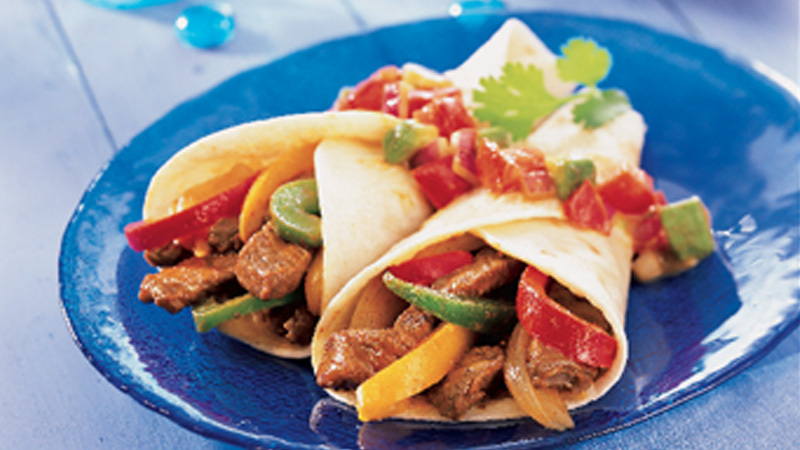 Divide the beef and vegetables down the centre of each warm tortilla and roll up. Serve with the guacamole salsa, soured cream and coriander leaves. Short on time - instead of making your own salsa simply buy guacamole and salsa and serve alongside the fajitas. Sprinkle a little finely grated cheese into the fajitas for extra flavour.